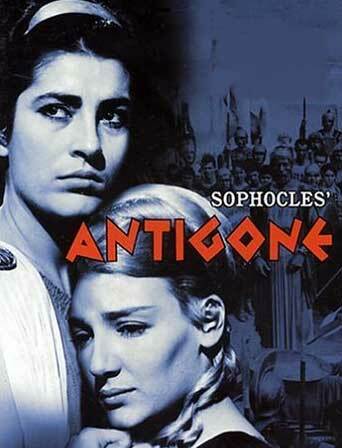 Antigone (an-TIH-guh-NEE) is a tragedy written in 442 BC by Sophocles. It is chronologically the third of the three Theban plays but was written first. After Oedipus is exiled, he leaves the ruling rights of Thebes to his two sons, Eteocles and Polynices who must take it in turns to rule. Eteocles rules first but the two become enemies after Eteocles refuses to give up the throne, and Polynices is exiled. He returns to attack in the Seven Against Thebes campaign. At the beginning of the play, both brothers are dead, apparently slain by the other's hand. The current ruler, Creon, has made a decree: Since Polynices fought against Thebes, he shall not be buried. Meanwhile, Eteocles is to be buried with full military honors. Antigone, the daughter of Oedipus and the sister of the dead brothers, believes this proclamation to be against the gods' orders. She confides her plan to bury Polynices herself to her sister Ismene. The more timid of the two, Ismene refuses to take part out of fear, but agrees with her motive. When Creon is informed that someone is trying to bury Polynices, he makes terrible threats. 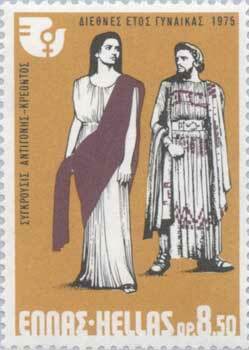 Antigone is caught the next time she goes to her brother, and brought before the furious king. Defiantly, she accepts her death. However, Ismene tries to claim that she also took part in the crime. Antigone's fiancé and Creon's son Haemon arrives, talking about how the whole city thinks Antigone innocent. He claims to be 'neutral', always telling his father that he is on his side. Creon, however, keeps yelling, going as far as to claim that Haemon has sold out to a woman. Finally, Haemon makes a threat that Antigone's death will cause another. When Creon scoffs, his son tells him it is not Creon who will die! Enraged, Creon decides to leave Antigone to starve in sealed cave. The chorus persuades him to let Ismene go, as she is innocent. The blind prophet Tiresias then tells Creon that his actions are not right. Creon sneers, mocking Tiresias with how prophets have always loved gold. His object of ridicule tells him that soon his own flesh and blood will die, and his actions are causing a miasma (pollution). Faced with this terrible prophecy, Creon is torn but comes to the conclusion that Polynices must be buried and Antigone must not be killed. He is too late: Antigone has already hanged herself in her cave, just as her mother Jocasta hanged herself (in Oedipus the King). Haemon makes his way to save Antigone, but finds her dead body in the cave. Creon also makes his way to Antigone to clear up the mess but is confronted by Haemon who is leaning over Antigone's body. Haemon threatens Creon but then ends up taking his own life. Haemon's mother and Creon's wife, Eurydice, also kills herself in grief over the death of both of her sons. (The other one died in the war against Polynices). Creon, having lost all of his family, loses his will and lets himself be taken away. His own decisions have come back with a vengeance, taking all that he cared about. The play is also notable as one of the only plays in which the inside of the palace setting is shown. Usually in Greek tragedy all action took place outside of the house or palace depicted on the skene (the backdrop of the stage); deaths took place "inside," unseen by the audience. In this play, however, the skene was opened to show Creon finding the body of Eurydice. The character of the sentry is also unusual, as he speaks like a lower-class person, in more natural language, rather than the stylized poetry of the other characters. He has been compared to similar characters in the works of Shakespeare.